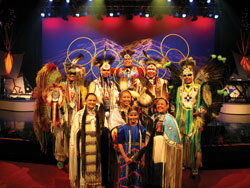 Brule' - A Native American Experience of Music & Dance is not currently performing in Branson. Brule' - A Native American Experience promises to bring a presentation of legendary entertainment, presenting both amazing vocals and brilliant dancing on the stage. This show is a full theatrical production with amazing moves by Brule', one of the most dynamic dance troupes of American Indian dancers today. Coupled with the energetic flow of these dancers are the sensational vocals they bring to their mesmerized audiences. One of the top-selling Native American recording artists, the group has sold over a million CDs worldwide and has a number of hits to their credit. Over the years, Brule' has developed a lengthy list of popular hits including All My Relations, Spirit Horses, And Justice For All, and The Chosen One. When this group hits the stage with their soul-filling songs and choreographed Native American dance at the RFD-TV Theater this summer, they will light up the house. The RFD-TV Theater provides an excellent setting for a show of this caliber, with both floor and mezzanine seating, and impressive sound and lighting systems that will add to your enjoyment. Reserve your seat at the show with an advance ticket purchase today! Combining Native American music with the rhythms and dance of tradition, this truly festive version of Brule' portrays serenity, solidarity, and a common ground among cultures. The breathtaking music and colorful costumes make for an astounding theatrical performance. Make your holiday season unique by experiencing the Brule'- A Native American Experience Christmas. Very different show. Not qut what i expected but not a bad show. This is one of the best shows branson has to offer. What a spiritual and moving experience for all ages. They are interested in connecting to you for the enjoyment of the experience, not just wanting your money and on to the next house full. Great show but got to get spirit horses in the show. We went to brule', the natiave american music show, last night for the first time and were blown away. Paul explained the stories behind each song. Absolutely colorful with haunting drum and flute music and dancing. We still have the sounds in our heads today. Unusual and wonderful experience. Guaranteed you will love it! !